In a move that comes as somewhat of a surprise, Brock Osweiler will get the start at quarterback for the Texans’ upcoming playoff matchup with the Oakland Raiders. Tom Savage, who sustained a concussion Sunday against the Titans, has not been cleared to return. "We have a lot of confidence that he will go out and play well for us,” head coach Bill O’Brien said of Osweiler. 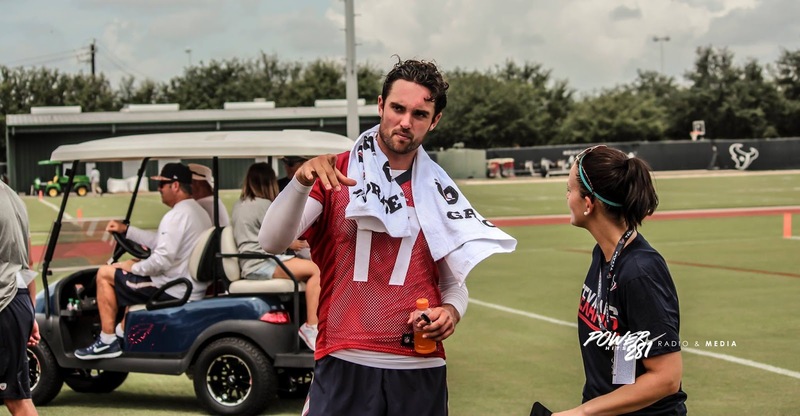 Being relegated to a backup role helped Osweiler, according to O’Brien. O’Brien also noted that Osweiler played well against the Raiders the last time these teams faced each other. Osweiler completed 26 of 39 passes for 243 yards, one touchdown and one interception against Oakland in Mexico City in Week 11. O’Brien said early in the week that the quarterback who would start against the Raiders should be the one taking practice reps during the week, according to Drew Dougherty of Texans TV. This put Savage’s status in doubt for the Wild Card round. Savage was not able able to clear the league’s concussion protocol to practice, clearing a path for Osweiler to get the start this week. If Savage is able to clear the concussion protocol before the end of the week, he will serve as Osweiler’s backup for this game. It will be the 26-year-old quarterback’s first opportunity to take the field in the NFL playoffs. Last year, Peyton Manning stole Osweiler’s only opportunity to play in late January, replacing the quarterback in Week 17 of the 2015 season and holding onto the starting gig throughout the playoffs. Manning, of course, led the Broncos to a Super Bowl championship. These clearly aren’t ideal circumstances for the Texans who had hoped Savage would’ve been able to make the start. Osweiler has thrown 16 interceptions in 14 starts this season after signing a lucrative $72 million deal over the offseason. That being said, this is a huge opportunity for the young quarterback to put his past behind him and make a name for himself by leading the Texans to their first playoff victory in five years. At the very least, Osweiler probably can’t be any worse than Brian Hoyer was in the Texans’ 2015 playoff loss to the Chiefs. After all, Hoyer completed just 15 of 34 passes — with four interceptions — in the 30-0 loss. Hoyer’s passer rating in that game was a miserable 15.9. A poor performance in the playoffs could lead to questions about Osweiler’s future with the Texans, as it has been pretty clear the team’s opinion of the quarterback has been changing in a major way. Osweiler hasn’t been good this season, but a strong performance could help the quarterback overcome his reputation as a free agency flub by Texans management. Osweiler’s starting certainly isn’t great news for the Texans, but to be fair, things probably wouldn’t have been much better with Savage starting anyway. For a team looking to win its first playoff game in half a decade, this is a scary scenario for the Texans. But the Raiders are dealing with their own quarterback mess — Derek Carr is out with a broken fibula, and backup Matt McGloin injured his shoulder last Sunday. The Raiders have not yet confirmed which quarterback will start, but it seems likely that it will be rookie Connor Cook behind center for Oakland. A home game against a banged-up Raiders team is a huge opportunity for Osweiler and the Texans to make up for past failures.